This week has so far has definitely brought both ups and downs. 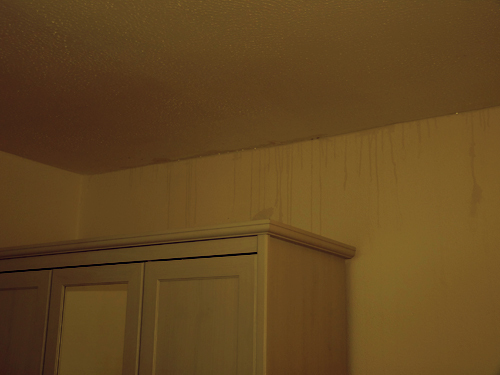 The week started particularly badly on Monday when, after a long day at work I came home to find our bedroom and lounge had been transformed into wet rooms, with water running through the ceiling and down the walls. This was because the week before we had solar panels fitted on our roof by Free Solar 4 U, whose contractors not only stained our carpets, left metal shards in our drive and failed to install panels that actually worked, but also smashed our roof tiles and punctured holes in the roof felt. Anyway, to cut a long story short they are now promising to put everything right, though the stains on our walls and ceilings are pretty awful to look at for the moment. 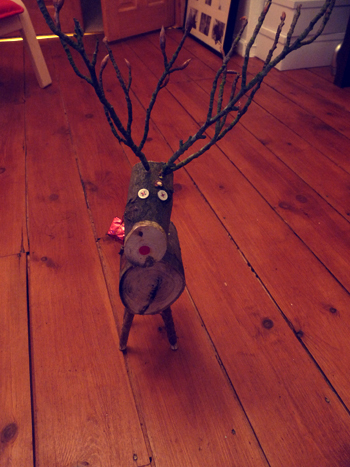 On Wednesday I came home from work to this little chap sat in my hallway. Introducing… Sven! Tom bought him for me to try and cheer me up after the drama of the day before. 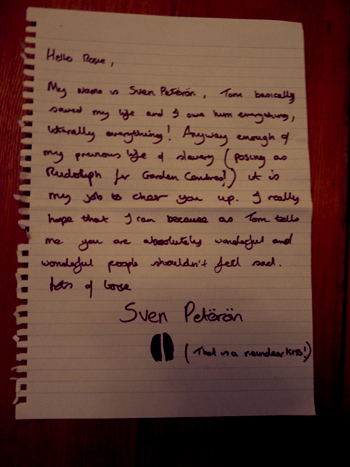 Here is a letter from Sven that was next to him when I found him. Not sure if you can read it – Sven has pretty bad handwriting, but then it is difficult to hold a sharpie when you have hooves. Today I had the morning off work to go with my very good friend Nicole, who was getting tattooed by BJ, who has also done all of my tattoos. 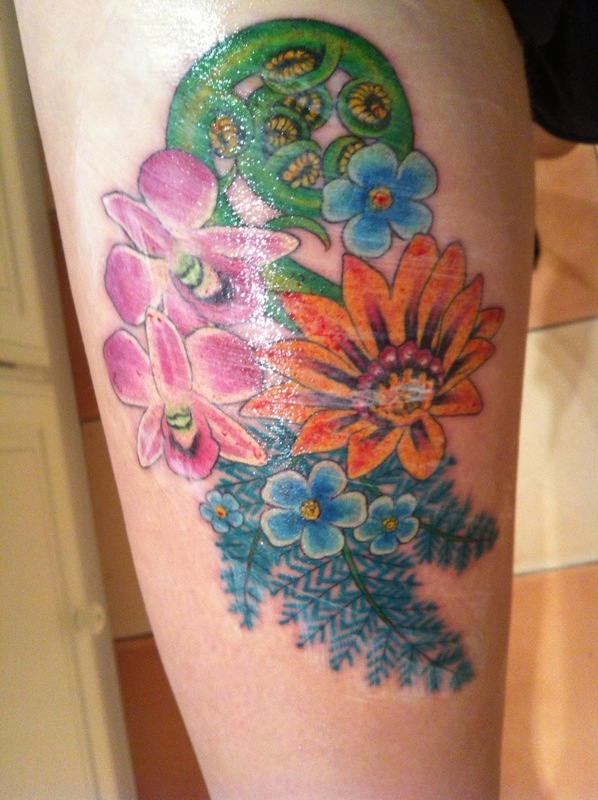 You can see Nicole’s lovely new tattoo in the second photo; it is a collection of flowers and ferns from places she has visited or holds close to her heart. Whilst tattooing Nicole, Barry was complaining that he wanted to add baubles or a dusting of snow to Nicole’s fern and was saying how he was desperate to do a Christmas themed tattoo. Our friend Ben, who works at the studio, agreed to let Barry tattoo the Coca Cola Father Christmas on him, and it looks amazing! You can see it in the third photo. 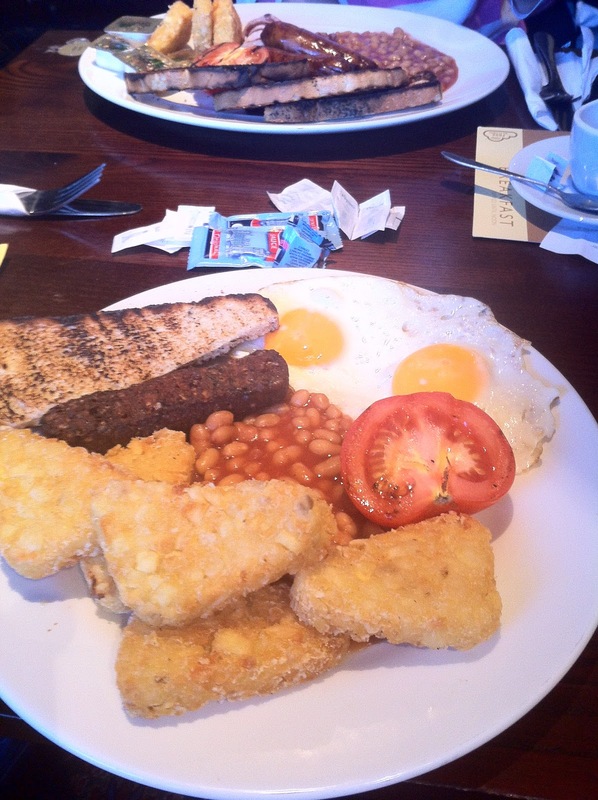 The fourth photo is of my breakfast this morning – it is a bit of a tradition of mine to go and get a Wetherspoons breakfast before going for a tattoo appointment! On a final note, I could not be more excited for the My Street Chic Bloggers Christmas Party and can’t believe it’s tomorrow already. Off now for a long bath and to frantically throw some things in a suitcase!